Another of the “Owl-Ween” programs at the Antigo Raptor Education Group's (REGI) center southeast of Antigo was held Tuesday evening, and while the only spooky feature of the night was the weather. Itt certainly was entertaining and educational. Future dates for the programs are on Thursday, Oct. 18 and Tuesday, Oct. 23. All tours run 5:30 to 6:30 p.m., perfect for an after-school family activity. The cost is $8 for teens and adults and $5 for children 12 and under. And it is well worth it. 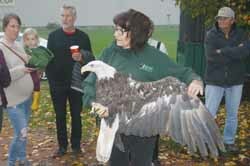 There was an added feature to the program Tuesday when Marge Gibson, director of the raptor facility, visited with a recently checked-in patient, a male bald eagle suffering from lead poisoning. Gibson, who has a special ability to connect with the education birds and winged patients, explained that the eagle is pale, and will need tender and loving care to bring him back to a more healthy status. Despite being in the center's care for just days, the eagle was very comfortable with Gibson, and allowed her to open his wings, which impressed the crowd. The “Owl-Ween” tour included a visit to see the ravens and crows, a stop where it was explained that the birds are very smart, and then onto the stars of the show, the owls. The guides explained the keen nighttime sight and unusually sharp hearing to allow the harvest of rodents - a dietary staple. The staff had three owls, all of them different, and explained their unique abilities. On Thursday, Oct. 25, REGI is sponsoring a special opportunity to Carve a Pumpkin with a Turkey Vulture, featuring REGI's own Morrie. It will run from 5:30 to 7:30 p.m. and will include carving, sipping on cider and discovering the world of vultures. Cost is $8 for teens and adults and $5 for children 12 and under. Online registration for the Owl-Ween tours and pumpkin carving are required at raptoreducationgroup.org/tour-schedule/. The events are all a lead in to REGI's second annual Hawk Tales and Cocktails, the nonprofit's largest fund-raising event, on Saturday, Nov. 3, 5:30 to 10 p.m., in the State Ballroom of the Central Wisconsin Convention & Expo Center in Rothschild. The event will include dinner, silent auction, raffle and entertainment by Art Stevenson and High Water. For details on volunteering, underwriting and more, contact Terri Johnson at terri@raptoreducationgroup.org. REGI cares for 800 to 900 injured and orphan bird patients each year including approximately 100 Bald Eagles and endangered species. It also provides public appearances and tours for more than 200 groups annually.